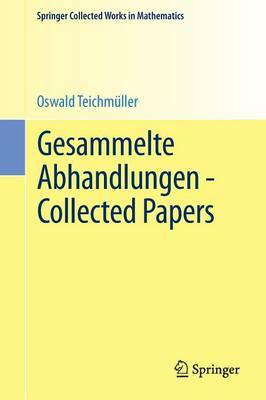 During his short life Oswald Teichmuller wrote 34 papers, all reproduced in this volume. From the Preface: "Teichmuller's most influential paper was called "Extremale quasikonforme Abbildungen und quadratische Differentiale" (No. 20 in this collection). At the time of its appearance several special cases of extremal problems for quasiconformal mappings had already been solved, and Teichmuller was able to draw on a substantial fund of experience. Nevertheless, it was a remarkable feat to extract the common features of all the known examples and formulate a conjecture, now known as Teichmuller's theorem, which in an unexpected way connects the holomorphic second order differentials on a Riemann surface with the extremal quasiconformal mappings of that surface. The paper of 1939 contains a uniqueness proof, which is essentially still the only known proof, but not yet a rigorous existence proof. This did not prevent Teichmuller from laying the foundation of what has become known as the theory of Teichmuller spaces, a theory that has mushroomed to an extent that could not then have been foreseen. At the same time Teichmuller's work led to a deeper understanding of the fundamental role played by quasiconformal mappings in all of geometric function theory, and it foreshadowed the subsequent development of the theory of quasiconformal mappings in several dimensions...the whole theory of analytic functions of one complex variable has been greatly enriched by the inclusion of quasiconformal mappings, much of it based on Teichmuller's seminal ideas."